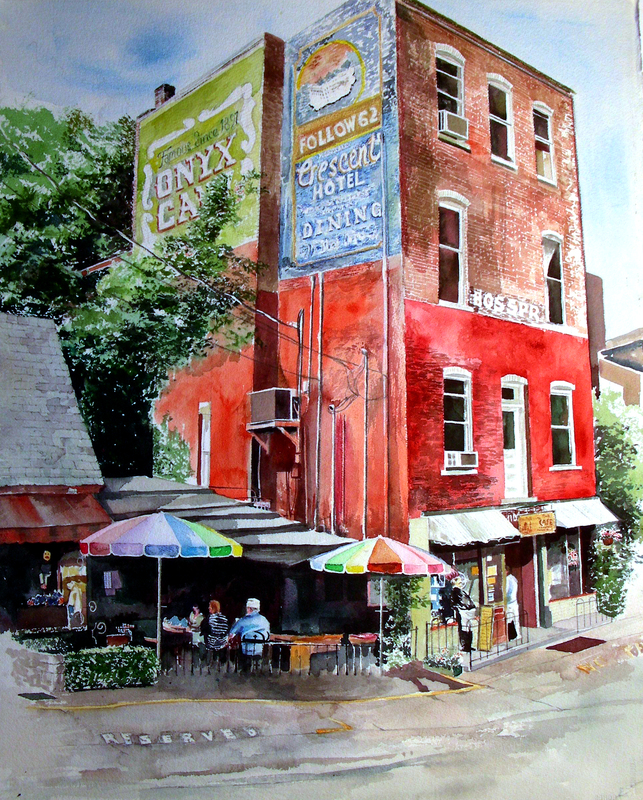 Eureka Springs Sidewalk Cafe Finished! What a thrill finally to finish this big one! 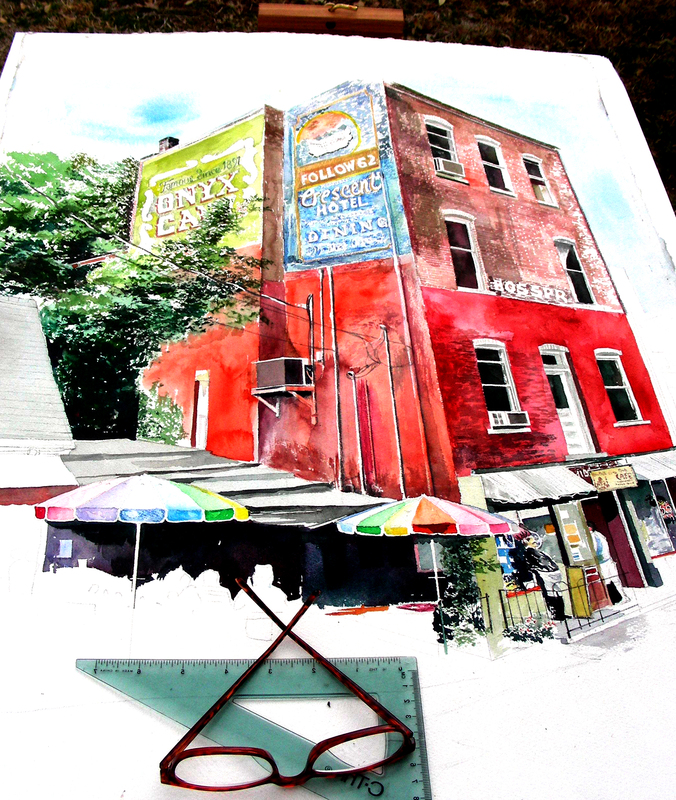 Just before the thunderstorms arrived, I laid in the final washes on the sidewalks and streets and declared it finished. It’s been quite a weekend. 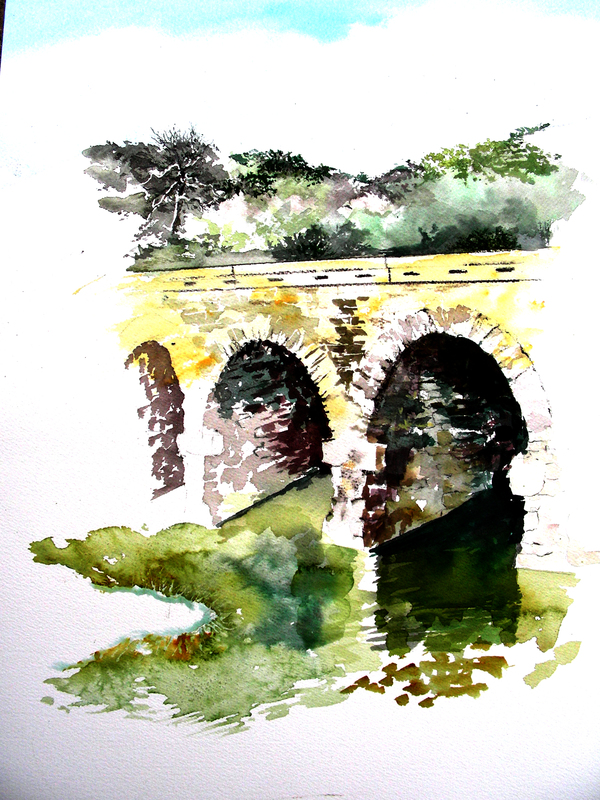 A long fly fishing excursion, a painting on location, time well-spent in conversation with a friend (and watching him attack and successfully complete his first watercolor) and finally, finishing this composition. The Crescent Hotel is featured on the ghost sign high above the gathered lunch crowd. “Ghost sign” is appropriate, as the Crescent Hotel is famous for its resident ghosts. I did not know until my second night there last summer that I was staying in a haunted room. That provided plenty of imagination at night when the lights were out and I heard creaking noises in the corridor just outside my door! At any rate, I survived, and would love to stay there again. I’ve been invited to participate in a faculty show at the Eureka Springs School of the Arts, and feel strongly that I should enter this piece, once I get it framed properly. I can’t wait to show it to my gallery director. I think this could be a good piece for my One Man Show this coming fall. Thanks for reading, and for following the progress on this one. Glad it’s done. Time to move on to the next! How about this for a first-timer? My guitar buddy, David Slight, has been asking me for some time if I thought he could create a decent watercolor. I always thought so. He picked up the guitar really fast, and I saw him fly fish for the first time, handling a fly rod with dexterity and landing a 3 lb. largemouth bass from a farm pond. So I shouldn’t have been surprised to see him knock this one out inside of two hours in my garage studio this afternoon. The painting measures approximately 12 x 14″ without the frame. I stood by to show him the basics–wet-on-wet, drybrush, graphite rendering, masking, scraping with x-acto knife, and he went right after it. He was so pleased that he’s decided to come back Tuesday after school (David is also a public school teacher in Tarrant County). Both of us probably wish that we could draw decent salaries by painting in the garage! So, here’s looking to next Tuesday! Thanks for reading. Thanks Dave, for a fabulous afternoon of art and quality conversation. 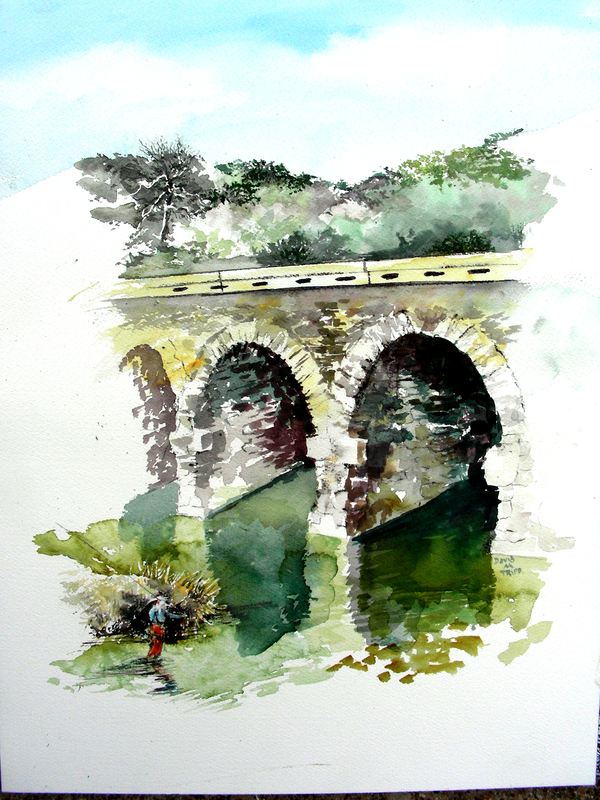 I decided to add a diminutive fly fisherman working the currents in the lower left-hand corner of this sketch. If I decide he doesn’t “work out,” then I’ll crop him out when I mat and frame the composition. I’m glad to have another watercolor sketch “in the box,” and delighted that I had yesterday’s outing/odyssey. 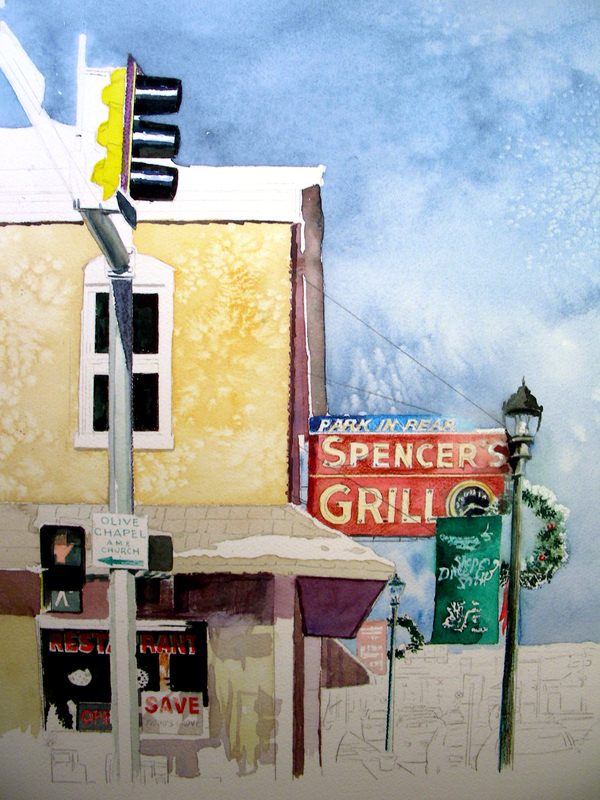 But now I’d like to finish up that Eureka Springs BIG painting. I’m getting kind of tired of looking at it and want to sign it off and drop it off. Saturday offered a break-out day for me. I set out early in the morning for a two-hour drive west to the Brazos River near Possum Kingdom dam. Rainbow trout are released there on five different occasions throughout the winter months. The day was wide open, as my wife Sandi was attending two separate equestrian events in Weatherford. Along the way, I had to stop at a classic auto show, where I photographed a row of six Hudsons from 1937-1956. I will no doubt be creating some watercolors of them sooner rather than later. I also encountered an “Edward Hopper” painting composition–a magnificent Victorian house high on a hill, bathed in the morning sunlight. Stopping also for a breakfast add-on, as well as a gasoline fill-up, cooler of ice for (hopefully) rainbow trouth and some bottled water, I began to wonder if I would make it before noon. I did. Last weekend, I was distracted by fly fishing, and at the end of the day, too pooped to get out the easel and paint, so this time I decided to reverse my priorities. I set up my French easel alongside the boat ramp and tried to capture this magnificent Highway 16 bridge over the Brazos. I worked as quickly as possible, mostly wet-in-wet, and then did some sharper definitional work, enough to capture where the details would lie. The sun grew hotter, my back and neck started to ache, so I broke down the easel, rigged up the fly rod, struggled into my waders and boots, and descended to the river. Like last week, I lost four and managed to get one on the stringer. I guess that’s what comes with a barbless hook (for me, anyway). The size 20 elk-hair caddis does manage to lure 10-12 inch trout to the surface, and I’ll never cease feeling the thrill of watching a riser bust the surface. Thanks for reading. I’m still tweaking this watercolor and may have a different “look” by tonight. Either way, I plan to be through with it by today’s end. I have bigger fish to fry! Today I was greeted with more lousy news from my school district. I left the campus angrily and shut myself into my man cave/garage studio, and soon the bitterness subsided and the sublimity of painting flooded my being–a good trade. I won’t go into the school crap–it’s not worth discussing. While gazing at this sidewalk cafe setting (wishing I could enter the picture! ), I listened to Voices and Visions documentaries on my TV/VCR and my soul was overwhelmed as I listened to the Ezra Pound saga–my word! How did the man survive so many years of incarceration and continue to pour out his Cantos? As I continued to listen, I was abruptly surprised to see that this painting is nearing . . . completion! Wow, how did that happen? 30 x 22″ of watercolor nearly complete, and I thought I had a couple of weeks at least remaining before I could think of stopping. I think the only areas that need more attention are the lower half of the cafe patrons, the foreground pavement textures, and . . . those umbrellas still don’t look right to me–perhaps more intense color? I’ll linger on that one. Tomorrow promises to be fabulous–a pretty day with temperatures rising. I’ve decided to return to the Brazos River to fly fish for trout (about a two-hour drive west). I’m taking my French easel and watercolor supplies along as well. 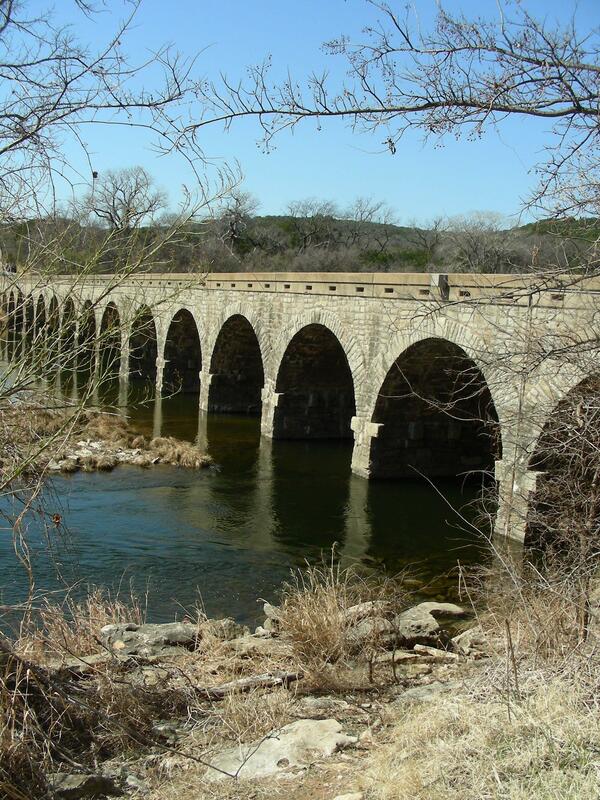 If all goes according to my wishes, by tomorrow night I’ll be posting a plein air watercolor of the Brazos River and the Highway 16 bridge near Possum Kingdom dam. Hopefully there will be rainbow trout on the stringer and a painting in the box! Thanks for reading. Talk to you tomorrow. Texas temperatures are getting better–80 degrees and sunny today. My garage has turned into an art studio/man cave for me, with a portable TV/VCR playing an assortment of tapes for my listening pleasure while I paint–lectures on Friedrich Nietzsche, T. S. Eliot, Ezra Pound, William Carlos Williams to name just a few. I feel myself entering this composition that I’ve tinkered with for several months now. I can almost hear the voices around the table discussing poetry, philosophy, theology, books–all the artistic elements that keep us alive and alert. 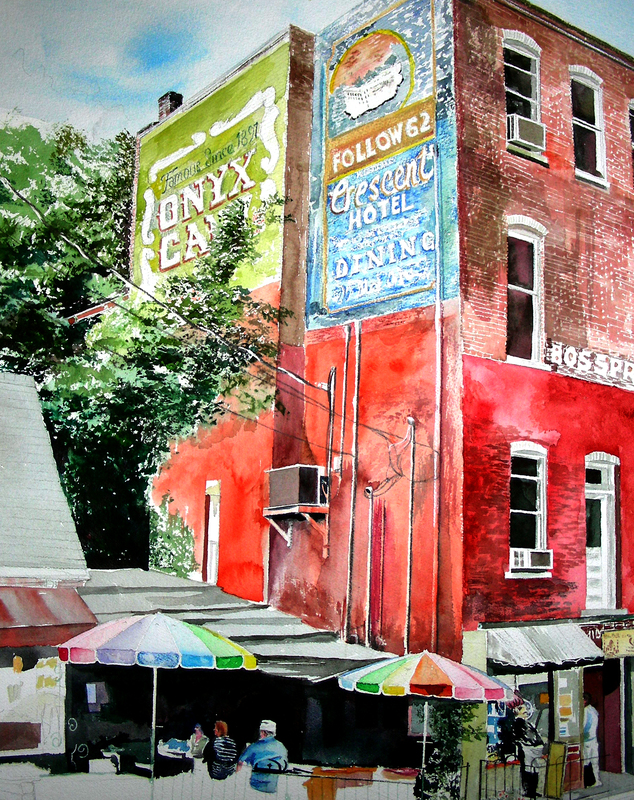 This setting is in downtown Eureka Springs, Arkansas, where it was my profound privilege to teach a week of plein air watercolor classes for the Eureka Springs School of the Arts. It was my first time, and I have an application pending there now, hoping with all I have that there will be a class again this year. 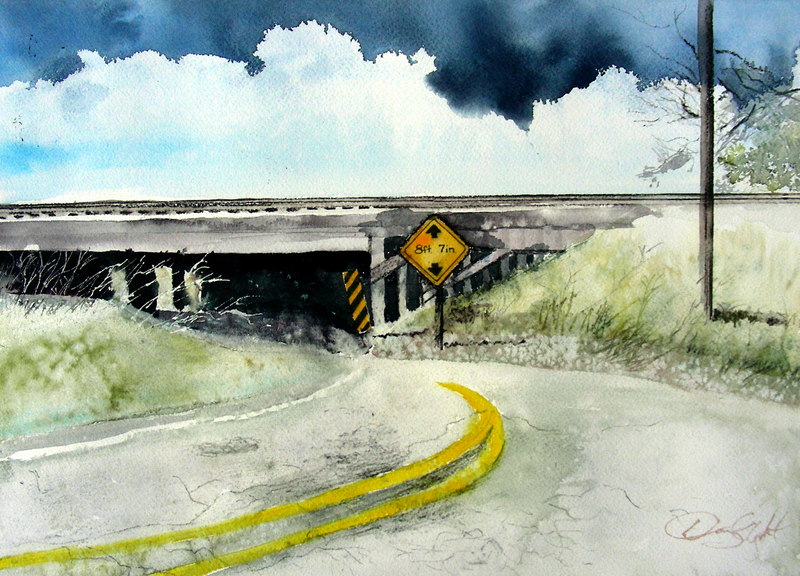 My two favorite towns so far are Waxahachie, Texas and Eureka Springs, Arkansas, for on-site watercoloring. 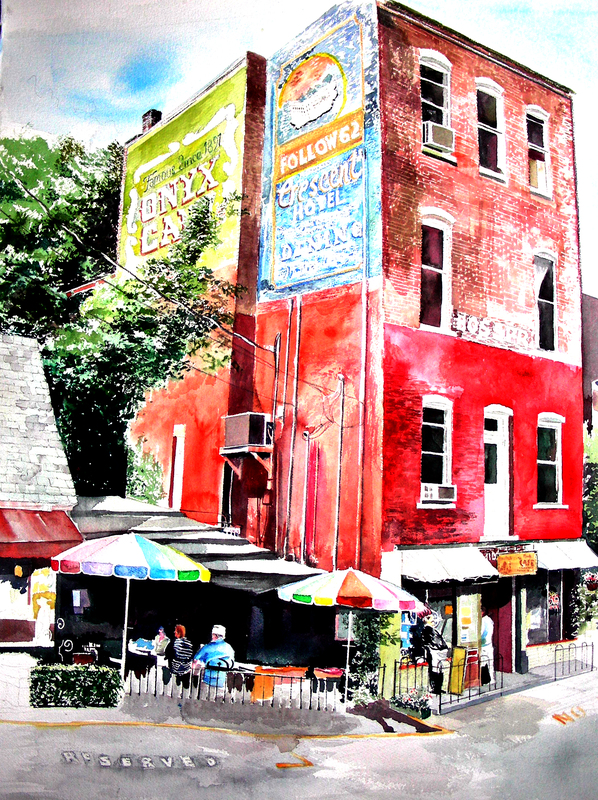 Both towns boast streets lined with Victorian architecture, flower beds, cute shops around the downtown district, and compositions for painting in any direction one looks. This particular painting is huge by my standards–30 x 22″–and it involves elements that are outside my comfort zone–people and a myriad of details. I have avoided genre painting for a number of years, realizing that there are countless artists “out there” who do it so exceedingly well. But I recently read something from the Journals of Henry David Thoreau that convinced me to go for this: “There is always room and occasion enough for a true book on any subject, as there is room for more light on the brightest day, and more rays will not interfere with the first.” All I had to do was substitute “painting” for “book,” and I got his point. My contribution to this genre of painting will in no way diminish what has been done by others, and yes, there is room in this world of art for me to contribute as well. So . . . with that in mind, I was liberated to go after this composition. Thanks for reading. Talk to you again tomorrow . . .
I’m glad to return to the garage studio. For any of you following my blog, I haven’t posted since the passing of Zeb Cash-Lane, simply because I haven’t painted since then. I needed a little time after his passing to sort some things out. Then my school district dropped its bomb. I have been in training for over a year to begin teaching in the International Baccalaureate Diploma program. You may have noted my watercolor blog posts from Lake Tahoe and Los Angeles while I was studying and attending classes in IB. Last week the district canceled the program. Texas public schools face a funding crisis, which has been the general law since 2005 (earlier than that, actually). The decision left me in a state of rage, that I’ve had trouble laying aside. Finally, I decided to pick up the brush again, and push the public school finance and politics behind me. The more I painted yesterday and today, the further school receded from my thoughts. The way I figure it, I only need another day or two to paint like nothing else happened. This composition has burned in my retina since I spent a week in Eureka Springs, Arkansas last June. I sincerely hope to return again this year. The Victorian town is absolutely breathtaking in the summer sun, and I took dozens of photos similar to this. I have a real compulsion now to work on some downtown scenes, particularly ones I can find with turn-of-the-century commercial buildings and their fading ghost signs towering above, muted against brightly-colored umbrella tables and modern signage below. I still struggle with my rendering of people in watercolor, but I’ll never “get it” until I do it more. So . . . there will be people in this one. Right now I’m working on a ceramic chef standing outside the restaurant. Hopefully I can get him to look right. Then I’ll turn to the patrons at the bottom of the composition. It’s good to be back in the garage studio. The weather yesterday and today was heavenly, with bright sunshine and cool breezes blowing. I was in the mood to push this painting for another hour or two, but heavy cloud cover has turned my outside world dark and gray. I really hate to work with studio lights indoors, but I just may have to this evening. Thanks for reading. I’ll see if I can make enough progress to blog further tomorrow. I’m getting excited about the possibilities of this painting, possibly the largest I’ve attempted so far–about 30 x 22″. Zeb Cash-Lane passed away yesterday, February 8, 2011. He had taken me under his wing back in 2006 when I was trying to find my way as a blues guitarist. I played side guitar for him at the Peppermill Lounge in east Fort Worth, Texas for a few months spanning 2006-2007. Zeb’s health was failing then, and when news came this morning that he had died, I could only hope he hadn’t suffered. I had seen him on many days when it was a struggle just to draw a breath. I’ll always remember with gratitude what he taught me about guitar, music, performance and a host of other matters relative to the music environment. And I will always recall the sensations of his Fender Stratocaster shrieking in the night as he belted out his original blues compositions. Last night, I had a life-altering encounter at a recording studio in east Arlington. I met for the first time Zeb Cash-Lane, an aged blues musician, specializing in harp and searing electric guitar (Fender Jazzman played through a Fender tube amp). It was a night to remember always and I now attempt to record the visions . . .
7:00 p.m. Thursday found me pushing my Jeep westward on Abram, with temperatures dropping, a chilly October evening and a sun sinking large, flooding the western sky with color. Looming silhouettes of tire shops and tattoo parlors paraded down the corridors of my peripheral glances. Finally, the cinder block building came into sight. 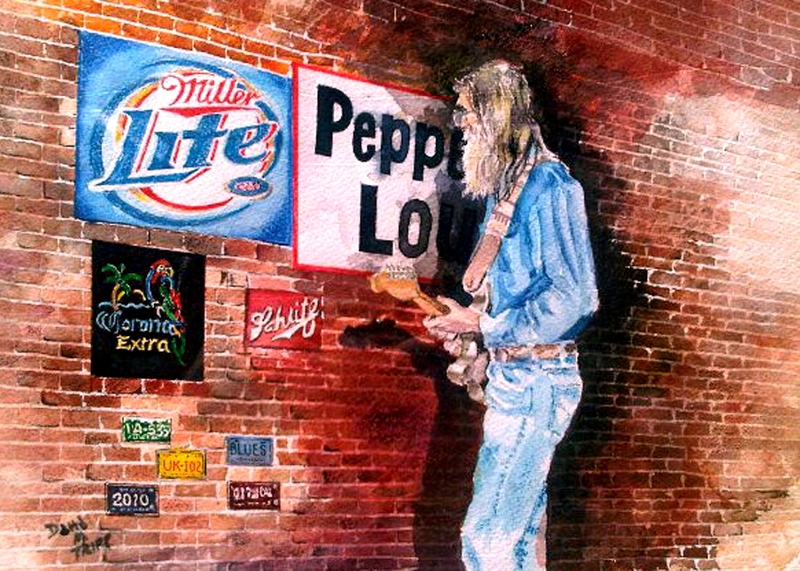 Jim Farmer waited outside on the parking lot with a slender, rangy man sporting a Rasputin-like full white beard, faded jeans, suspenders and a gray-blue “Charley Guitar Shop” T-shirt. I was introduced and shook hands with Zeb Cash-Lane. 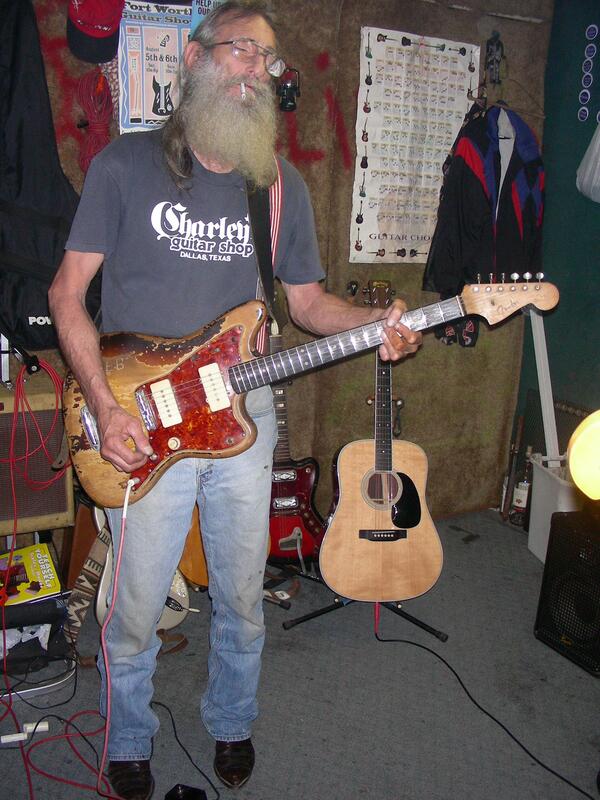 Inside the dim studio room that doubled as Zeb’s dorm room, we heard the searing electric blues that Zeb ripped. It was an authentic Blues environ: whiskey bottles, ashtrays, Zeb rolling his own cigarettes, scattered amps, guitars, a cello and even an upright piano. The room had the clutter of a maintenance shed or electrician’s shop, but it was a music room. A Blues room, a three-dimensional photo gallery of where Zeb was and where Zeb had been. Jim Farmer played his new electric bass, Zeb played his Fender Jazzman and I played my Martin D-35. The Blues seared, screamed and moaned late into that cold October night. Inside, the guitars cried while outside, the winds answered with a chorus of mournful, yet affirming howls. Stormy Monday set the tone for the Blues night in the studio. After hours of playing, we sat outside on the concrete steps, weary but full of hope about our musical collaboration, and shared stories over cold beers. I drove home, late in the night, numbed by the experience. I’m amazed at the quality of work posted on these blogs from around the world. Tomorrow will mark our fourth consecutive day of school closures. I’m still tinkering with this late into the night, reminiscing about late-night diners, coffee and conversations that remain with me. Hopefully I can keep my momentum going right into tomorrow and the weekend. This painting is growing on me.